So, you’ve probably seen the Amazon Dash Button - a compact little wifi connected button. There have been loads of different “hacks” circulating on the internet, and since they were recently released in the UK I decided to order one. One day later I had it toggling my Lifx light bulb thanks to the countless tutorials on the internet. I followed Steven Tso’s blog post and it only took me about half an hour. 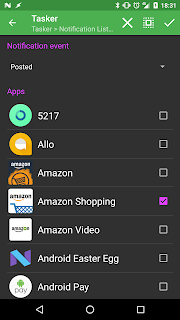 Setting up the Dash Button with the app was simple, and cancelling at the final step (selecting the product) let’s you press it without ordering anything. Since the Dash only connects to WiFi when it’s pressed, the majority of the “hacks” online involved monitoring the WiFi network, waiting for the Dash Button to join, and then executing the relevant code. Works great… Until your internet dies. I don’t know about you but I have to restart my WiFi router almost daily to avoid slowing down, which seems to break the ARP monitoring code. When trying it again today, I realised that I could utilise the pointless notification that appeared on my phone instead of ignorantly swiping it away. It works quicker, and works whenever my phone is on and connected to the internet. Essentially 24/7. Notify that the lights were toggled. Nice and simple. I’ll walk you through each step with the screenshots below. 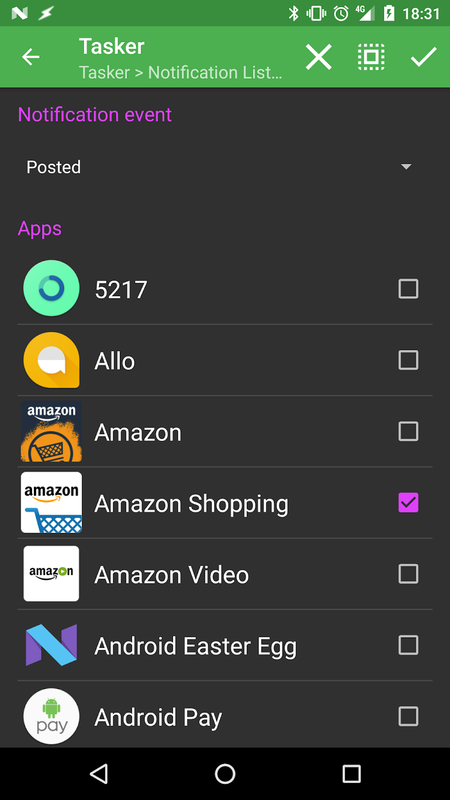 I expect you to have the Amazon Shopping app installed and to have setup the Dash Button (skipping the last step), with Dash Button Notifications switched on. Let’s start off by downloading a few apps: Tasker (£2.99), Notification Listener (free with IAP) and Auto Hue (79p - my plugin of choice). 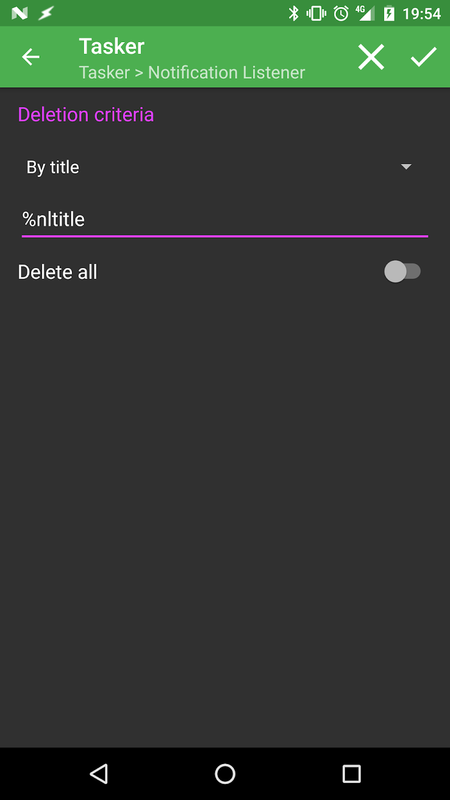 Open tasker, accept the disclaimer and then press the big + button at the bottom. Tap on Event > Plugin > Notification Listener > Notification Listener. 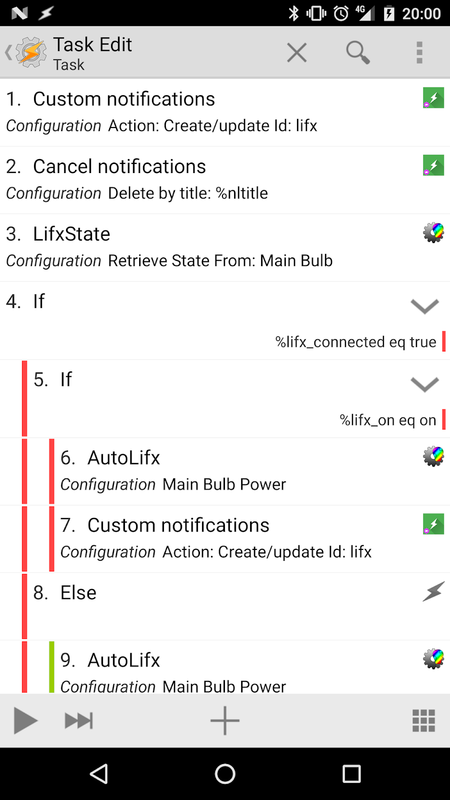 Enter the plugin configuration by tapping the Edit icon. Select notification event “Posted” and select the Amazon Shopping app. Tap the tick and move on. 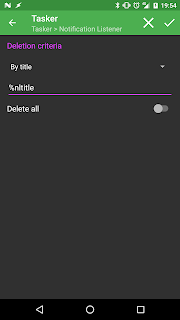 Press back to save the configuration and tap New Task & give it a name. Now we have intercepted the notification, we can clear it. 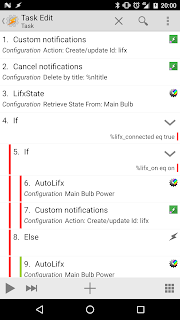 Tap the + button and navigate back to the Notification Listner plugin. Tap on Cancel notificaions this time. Enter the configuration screen and choose “By title” in the dropdown. Enter %nltitle in the text field. Save the configuration and proceed with step 3. Create a notification to indicate that the Dash Button press was received. If my lights are on, then turn them off and replace the notification saying the lights were toggled. Anyway, that rounds off this pretty long guide. I applaud you if you got this far, and I hope I’ve helped ya. Recently I started redeveloping an Android app in order to try and take advantage of some of the new techniques that "modern Android devs" are using. I must say, the many hours of reading up and research was totally worth it - MVP keeps everything much simpler, Retrofit stops me from having to build API calls myself and RxJava handles threading - letting me focus on the code instead of avoiding the dreaded memory leaks. I came across this post on Reddit and was surprised to find that there were no suggested solutions that would automatically add my loved tracks on Last.fm to a Spotify Playlist. Immediately, I thought back to the "live Twitter bio" post I wrote a few weeks back (or months, I've completely lost track of time over the exam period). If This... Head to https://ifttt.com/create, login and set the trigger to "RSS". Hit new feed item and enter the feed url https://xiffy.nl/lastfmrss.php?user=danster103&loved, but change the username to your own. 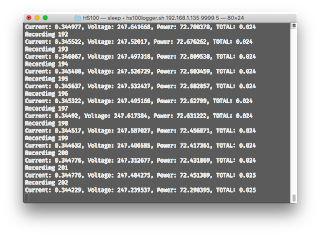 Monitoring energy is a rather large interest of mine - my family have solar panels. It's interesting to see trends in our energy usage with my app, however it doesn't give us any information about which devices in particular are using the most energy. I happen to use a HS100 smart plug to control my desk but was disappointed by the little information that the Kasa application displays and therefore have never used it to track my energy consumption. Today I got a bit of free time and decided to look into reverse engineering the smart plug. Luckily this had been done before by @ggeorgovassilis on GitHub so I didn't need to look into it myself - I just grabbed the script, made a few modifications and then wrote my own logging shell script.